Semo Port has access to the two major western rail systems, Burlington Northern Santa Fe Railway and the Union Pacific Railroad. The Semo Port Railroad (SE) provides local switch service in addition to interchange with the UP and BNSF. This gives customers the best in rail service: competitive access to two major railroads, combined with friendly responsive local service. Semo Port purchased a six-mile Union Pacific branch line in 1994 and established the Semo Port Railroad (SE), a common carrier switching railroad, to serve the Port and surrounding industrial areas. A one-mile extension to Semo Port’s harbor industrial area was completed in 1995. 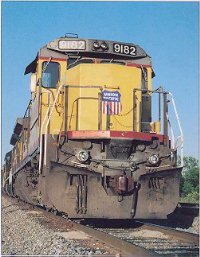 Semo Port Railroad connects with two major railroads: the Union Pacific Railroad and the Burlington Northern Santa Fe Railway. This allows Port customers to obtain competitive rates and service. SE provides local switching services tailored to meet the individual customer’s requirements for inbound, outbound, and in-plant movements. SE personnel can assist customers in ordering empty cars for loading, tracing cars (loaded and empty), and shipment billing. Motive Rail Corporation is the rail freight service contractor, providing transportation and other services to SE under contract. The SE’s six-mile mainline has heavy welded rail (115 lb and 133 lb in curves). As a former UP branch, it handled heavy 100-car unit coal trains between southern Illinois and Missouri until 1990. The Harbor Lead track has 115 lb jointed rail. SE can handle 287,000 pound cars. Clearances allow movement of shipments handled on the main lines, including doublestack container cars (20’3″ height, AAR Plate G). SE’s switch charge is typically paid by the linehaul railroad (BNSF or UP) and absorbed as part of their rate. Customers requesting rates to/from Semo Port MO should check that the BNSF or UP rates include the SE switch charge. The customer receives a single bill from the linehaul railroad. For specific rules and charges, including demurrage, refer to SE Tariff 8000. The Burlington Northern Santa Fe Railway (BNSF) is one of the two major western rail systems in the United States. With over 40,000 miles of track and over 43,000 employees, BNSF serves 28 states. At Cape Girardeau MO, Semo Port Railroad (SE) connects with BNSF’s main line between St. Louis and Memphis. Through St. Louis, the BNSF has routes to Chicago, St. Paul, Kansas City, Denver, and Seattle. Through Memphis, BNSF routes serve Birmingham, New Orleans, Houston, Dallas, California, and Mexico. The Union Pacific Railroad (UP) is one of the two major western rail systems in the United States. With over 33,000 miles of track and over 48,000 employees, UP serves 22 states. At Capedeau Junction MO (east of Scott City), the Semo Port Railroad (SE) connects with UP’s main line just west of the UP’s double-track bridge over the Mississippi River. To the north, the line splits into two routes to serve St. Louis and Chicago; service beyond is offered to Kansas City, Denver, and Seattle. To the south, UP’s lines from North Little Rock serve Memphis, New Orleans, Houston, Dallas, Mexico, and California.